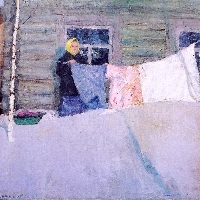 Sergei Sergeevich Rumyantsev was born in Zavrazhe, Kostroma reg., 1928. He studied at the House of People's Creativity, Kostroma, 1957-59, and simultaneously on an art course of Central House of People's Creativity, Moscow (correspondence course). Member of the USSR Union of Artists. Active in Kostroma. Specialised in landscapes and still lifes.